Together We Feed® (TWF) has a mission to eliminate childhood hunger and develop communities of hope and opportunity. TWF wants to get as much healthy food to as many hungry children as possible, while also building a sense of support and community around each child. 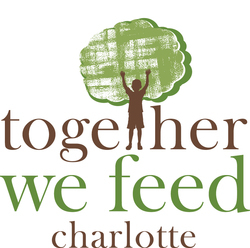 By working through Charlotte Mecklenburg School (CMS), we aim to eliminate childhood hunger and food insecurity. We want to feed, care, and connect with children in need so that they develop a well-nourished physical life, leading to a commitment to education and hope for rising out of poverty. We engage our local businesses partners to inspire children to reach toward a promising future by providing meaningful experiences and relationships. We strive to create pathways of change so our children grow up to contribute their best for a stronger city. Our volunteer opportunities enable individuals to connect with children and families, creating a broader community of trust and hope across the Charlotte area.